Fortress Of Freedom Board :: View topic - TWENTY6HUNDRED Signs With FOF and FOF Records! Posted: Fri May 26, 2017 2:08 am Post subject: TWENTY6HUNDRED Signs With FOF and FOF Records! 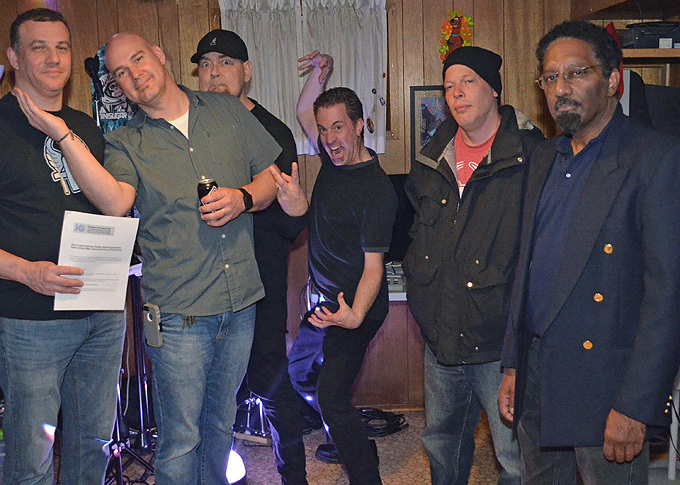 From L-R: Mihai (holding the contract), Randy, Michael, Jim, Shane (FOF/FOF Records) and Maurice (FOF/FOF Records)! FOF Records Inc. and the Fortress of Freedom Corporation are excited to announce that we have signed an agreement with TWENTY6HUNDRED to release the band's next album. This is the third such contract that follows an EP in 2006 called Free with Purchase and an album in 2014 called Electric for All. So from all of us at FOF Records and FOF, we all wish the best to Michael, Mihai, Jim and Randy of TWENTY6HUNDRED on the production of their upcoming album!